This is the ninth in this series of 26 posts, one for each letter of the alphabet, that I am writing during the Blogging from A to Z Challenge, April 2016. You can find all the posts, as they are published throughout the month, by following the A-to-Z April 2016 tag. Not to worry. Aikido is something anyone can do. We all have our challenges, and it’s possible to train – and even teach – with just about any condition. There are students and teachers who are blind, have one arm, have cerebral palsy, use a wheelchair, have Parkinson’s, etc. Not to mention all the usual issues we accumulate throughout life: a bad knee or iffy back, a shoulder that needs a little extra stretching, or a body that’s just weak and stiff from years of sitting at a desk. Some things improve with time and patient work, and others we learn to work with. Anyone can do Aikido, but we all do it in our own way. A short, stout student and a tall, lanky student will each do a technique a little differently. One person may need to work more diligently on getting their rolls and falls round and soft, while another may need to learn to slow down and feel their way through a technique, rather than rushing and using force. I need to warm up before the warm ups, to get my heart up to speed and my blood flowing. Someone who seems perfectly fit and capable might be struggling with the idea of being attacked, after a long-past trauma. These things aren’t problems, they just require appropriate adjustments. The above quote got me through some rough times at the beginning. I was 46, out of shape, and with a whole array of uncomfortable and troublesome health issues. While no one ever hinted that I didn’t belong at the dojo, at times I questioned whether I was in the right place. There’s something about the founder himself saying “Everyone has a spirit that can be refined, a body that can be trained in some manner, a suitable path to follow.” Everyone. Not just young people. Not just the physically gifted. Everyone. Those are sweet words to an unsure beginner, and I have found them to be true. Everyone can discover and develop themselves through training. Everyone improves with consistent, conscious practice. I am not the sharpest tool in the shed – Aikido does not come naturally to me – but I am persistent, patient, and determined. And I’m doing OK. Strength and size do not give you an advantage. In fact, O Sensei was only about 5’ 2” tall. As I mentioned in the previous post (History – How Aikido Came Into Being), he had to stretch himself taller just to be accepted into the military! Many strong people fall back on lifelong habits of using force. 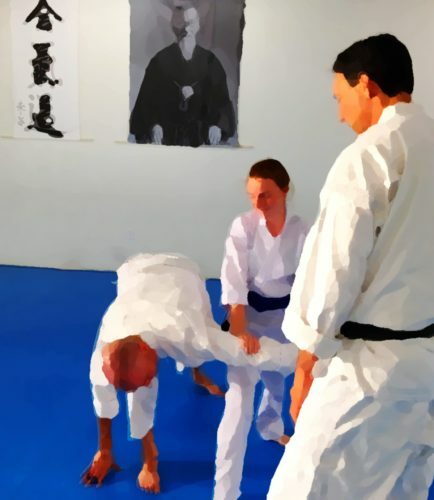 Physical prowess in other areas doesn’t necessarily carry over to learning the subtle alignments and connections in Aikido techniques. Accomplished athletes are sometimes taken aback at how different Aikido is from sports, where they may have excelled. Aikido is a diverse and welcoming community. I would hope this could go without saying, but since it may not be obvious I’ll go ahead and say it: The Aikido community is as welcoming and open as any group I’ve come across. I’ve never heard a racial slur on the mat or at an Aikido event. I’ve never heard anyone attacked for their religious beliefs. I’ve never heard anyone imply that this or that group, lifestyle, or body type should be excluded or discouraged. We have had members and visitors from around the world, and from many cultures. (All right, I don’t believe we’ve had any Inuit people at our dojo…) More diversity would be even better. The people I’ve come across have been universally supportive and accepting. I have seen students of all kinds training amicably together – people with nearly-full-body tattoos, law enforcement and military personnel, high school kids, retired folks. The Aikido people I know include biotech scientists, college students, a guy who worked in a recycling plant, business owners and entrepreneurs, an optometrist, a pharmacist, and a public health nurse, parents and their kids, plumbers, electricians, software engineers, accountants, a minister, a film producer … There are some living paycheck to paycheck, and others who are wealthy. There are reserved, serious people, and bubbly, outgoing people. And everyone gets along beautifully. Whatever your age, body type, personal history, fitness level, or whatever, if you are interested in training the thing to do is to begin. Visit a dojo, talk with the sensei and explain any concerns. You will be welcomed, and you won’t be alone. You’ll find that everyone has their unique troubles – or they will eventually. You can even be a role model for others! You won’t get any younger, but you’ll likely feel younger. You’ll almost certainly gain endurance, balance, core strength, and flexibility. More important, you’ll learn to work with what you’ve got available at the moment, which will serve you well throughout life. And you’ll very likely gain a warm group of friends, and have a great deal of fun along the way.